Hello there, Mr./Ms. Contender for the faith. It is once again a privilege and a challenge to sit down at my gray-and-blue DELL laptop with its blank screen, and fill it up with words that I pray will make a difference for you. As I begin to write, I think of individual people whom I know will read this column, some of whom I have known and loved for a long time, and I wonder who else will read these words. I am highly motivated to do more than fill up space, but rather to say something that will help whoever you are to get closer to The Man Who is The Plan because The First Man ran. Well, Summer is drawing to a close, and this month (August) I had the privilege of going to a small lake in the Adirondack Mountains in way–upstate New York, like 25 miles from the Canadian border. It is one of my favorite places in the world, a place where I spent some of each of my boyhood summers through high school. My cousin now owns the house that was my grandmother’s, and she invited us to come and visit. As I sat on the dock, drove the boat around the lake, and hiked through the woods, my heart went right back to the summer of 1961 when I was 17 and came there with my family for the last time. Little did I know during those carefree days of waterskiing and partying what the next 42 years of my life held in store. Elizabeth and I sat out on the lake in the boat one night under the stars, reflecting upon God’s grace and mercy in my life, and my heart welled up with great thanksgiving at the amazing privilege I have to know who I have know and be a part of a Christian movement that is unique in the annals of Church history. Has my behavior during the past 42 years been unblemished? No Way. I recognize more clearly than anyone else how often I have failed and fallen short of God’s best for me, and I sometimes agonize that I am not “farther along” so that I “know all about it.” I cringe when I hear people saying that they “grew up” in Boston or wherever, because I know that I haven’t. And my birthday this coming November has a number attached to it that is the most “thudding” to me of any so far. I wish I could say it were 50. In other words, my negative “hang time” has put me more soberingly in touch with the gruesome fact that I am getting older, and that presents me with a paradox (actually, I may now need two physicians): I more deeply feel the urgency of time passing than I did when I was younger, but I don’t have quite as much energy to do something about it. Hence, the many herbs and vitamins—I just want to dunk the basketball once. What I share in the rest of this column is designed to encourage you to take full advantage of each day you have to live for the Lord; no matter what age you are now. Our heavenly Father is all about starting wherever you are, as many times as you need to. For quite some time now, my On The Edge columns have focused on such internal issues of the heart, those things vital to living God’s truth from the inside out. So in this column I’d like to take a different tack and focus on the five basic “activities” of the Christian lifestyle, with an emphasis on speaking God’s truth. What are they? Prayer, study of the Word, fellowship with other Christians, sharing your faith, and giving of your material goods, all of which are found in Acts 2:42–47, which is sort of a mini-blueprint for how the Church is to function. Doing the basics is the key to growing into your personal ministry. 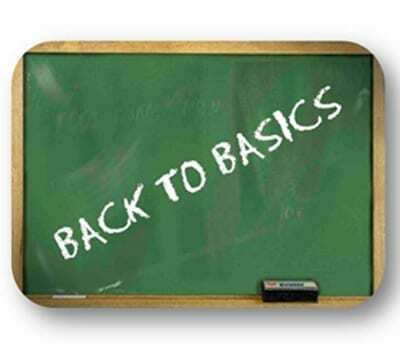 How a Christian is doing can usually be evaluated by what he is doing in regard to the basics. Guess what? There is a Greek word that neatly ties these five things together. So let’s get Bibley (my poor computer keeps underlining my made-up words). It is used only five times as a noun (prothumia) and four times as an adjective (prothumos), and in the KJV, it is translated, “readiness of mind,” “readiness,” “willing mind,” “ready mind,” “fowardness of mind,” “willing,” and “ready.” The leprechaun I insulted (Bullinger’s) said that it means, “predisposed, willing, eager, zealous.” The Greek word thumos has to do with passion, deep human feelings that often motivate us to action, and prothumos has to do with passion beforehand, that is, making a fervent decision to act according to God’s exhortation. Contemporary adjectives would include “fired up,” “psyched,” “stoked,” “all about,” “all over,” etc. So let’s take a look at the attitude each Christian is supposed to have in regard to prayer, study, fellowship, talking to others about Jesus, and giving. I’ll point out the key verses, and you can do whatever degree of studying you want to about each point in order to see how the other people in your fellowship are doing. If you didn’t get that last line as a joke intended to get you to look at yourself in regard to these five vital activities, God have mercy on your soul. In Matthew 26:41 (and Mark 14:38), Jesus is agonizing in Gethsemane, and he finds the disciples sleeping. He says, “Watch and pray, that you enter not into temptation: the spirit indeed is willing [prothumos], but the flesh is weak.” How big a deal is prayer? What kind of example did Jesus set in his prayer life, despite his busy calendar? What does the Word say about how our prayers help make it possible for God to get involved “on earth” (see “Lord’s Prayer”) and change the course of human history? How often in Scripture does God exhort us to come to Him with anything and everything on our hearts? How often does He promise to answer our prayers? Teachings we’ve done that I think would inspire you regarding prayer are Let Us Pray and You Are The Only You God Has. In 1 Peter 5:1ff (KJV), Peter is speaking to elders in the Church, encouraging them to be examples of godliness in light of their hope of reward for so doing. In verse 2 he says: “Feed the flock of God that is among you, taking the oversight thereof, not by constraint, but willingly; not for filthy lucre, but of a ready mind [prothumos].” How concerned is God with quality leadership for His people? How vital is heart-to-heart fellowship for each member of the Body of Christ? How critical for your quality of life is it to be interdependent with others committed to the truth? Can we discover our individual ministries by ourselves? How badly do we need one another? Regarding fellowship, I suggest two books we carry called Loving God’s Way and Boundaries, as well as our audio teachings, The Ministry of Reconciliation: Making a Difference; and What is Christian Leadership? Romans 1:15 (KJV) is a classic declaration by the Apostle Paul: “So, as much as in me is, I am ready [prothumos] to preach the gospel to you that are at Rome also.” Excuse me, but in those days ROME was about the most challenging place you could find to preach the Gospel (it’s no picnic today, either). So why was Paul so stoked to walk right into the lion’s den, so to speak, and “sock it to ‘em”? Because of what he says in the next verse: “For I am not ashamed of the gospel of Christ: for it is the power of God unto salvation to everyone who believeth….” Later, in Romans 10:14, he almost plaintively pleads: “How, then, can they call on the one they have not believed in? And how can they believe in the one of whom they have not heard? And how can they hear without someone preaching to them?” Good questions, huh? Regarding sharing your faith with others, I recommend our audio teaching, Shining Like Stars in the Universe. In 2 Corinthians 8 and 9, the only two chapters in the Church Epistles specifically addressing the issue of financial giving, we find four uses of prothumia (8:11, 12, and 19, 9:2), which speak of the eagerness that the saints in Corinth had expressed about helping others in need. How big a part do material things play in our lives? What does God tell us about the proper stewardship of that with which He blesses us? How can you find out if you have a ministry of giving? Can we spread the Gospel around the world without money? If the love of money is “a root of all kinds of evil,” what magnitude of blessings, both material and spiritual, could be ours if we properly relate to money? Regarding this subject, I recommend our audio teaching, The Joy of Giving. Simple, huh? We keep our hearts open and honest before God and our brethren, and do those five things. OK, go ahead. In closing (that gives the reader hope), it is on my heart to talk about the privilege of speaking the Word and encourage you to do it, whether to one person or to as big a group as you can get in front of. Recently I found some old notes from seminar I used to teach, titled The Joy of Teaching, and was inspired by them. That prompted me to think about the awesome privilege I have had to so many times in my life stand (or sit—and once in the Philippines when I was really sick to repeatedly double over and put my head between my knees each time the interpreter took his turn—be sure to catch that one on Heavenly Videos) before so many people in so many venues during the past 35 years. But how did that happen? It happened because once upon a time I decided to start doing just that, and I guess God was hard up for folks, so He has allowed me to continue. What about you? Have you ever taught the Word? Did you enjoy doing so? Did anyone else enjoy it? If you once did teach the Bible regularly and now do not, maybe it would bless your life—and others—to start expounding the Scriptures once again. Hey, I’m not trying to bust your chops here, I’m trying to inspire you to take advantage of the opportunity you have to do one of the most incredibly important things you could ever do—and something that too few people in history have done—teach another human being the truth about God and His Son. If you do, who will benefit? You and all those who hear and believe what you share with them. EVERYONE is looking for what we have to offer—love, joy, peace, real life—and many will believe that Jesus Christ is where they will find it—if they hear an articulate exposition of the Gospel. Honestly, how many places are there today where someone can go and find that, including clear teaching on who is Jesus, the administrations in Scripture (specifically that of the Sacred Secret), the Hope, the Giver and the gift, the state of the dead, and the necessity of getting in touch with the sin that dwells in us??? If you are one of the comparatively few humans who know these truths, why not declare them? Personally, I want to be like Paul—prothumos to preach, and I would guess that you do too. Beginning a psalm that clearly points to the coming Messiah, Psalms 45:1, in a fairly literal translation, reads: My heart is bubbling up and overflowing with a noble theme as I speak of things concerning the king. My tongue is the pen of a ready and skillful writer. Is that cool, or what? That is just how God would like for each of us to feel about telling the greatest story ever told. I think God is still hard up for people to lovingly and accurately teach His Word—so there’s room for you and me! Why not start with one person you know, or a stranger if you like, and tell him about the Lord Jesus Christ? Why not ask God when, where, and how you could share the Word with a group of folks? Why not “seek an occasion” to touch people and wreak havoc on the works of the Enemy in their lives? Why not pray for doors of utterance and then take advantage of every opportunity to speak the truth in love? Why not go out on the edge?